With the sun shining today, we wanted to head out and fancy trying somewhere new. 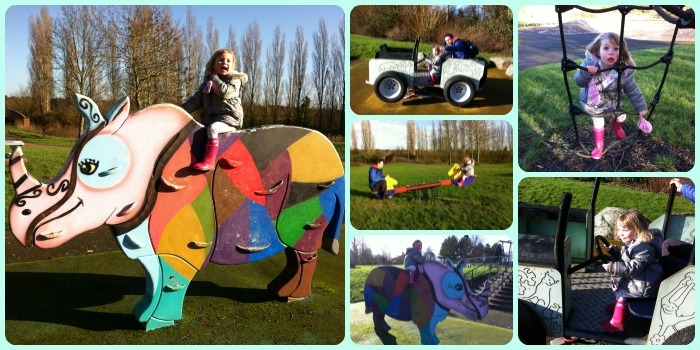 I recently spotted a post on the Parks in and around Milton Keynes Facebook page about a park with some really fun looking play equipment, including a Rhino, so that's where we headed. The Rhino Playground in Downhead Play Park is tucked away in a housing estate in Milton Keynes so you wouldn't know it's there. However, it was really easy to find. We parked along Colesbourne Drive right next to the park and could immediately spot the Rhino! Little Miss A wasn't too sure about climbing the Rhino at first and explored the other play equipment first. Then I managed to persuade her to have a go! Along with the usual swings, roundabout, see-saw and slide, there was also a really great jeep car. This was a real hit with Little Miss A as it was on springs so you could bounce it around. We went on a bumpy safari ride on the jeep, spotting all kinds of (imaginary) animals! Each of us took a turn at driving. Along with the play area for younger children, there was also a section with some equipment for older kids including a climbing frame, basket swing and wobbly bridge. We tried it all out! After a long play, we decided to take a wander over the canal. As we went over the bridge we stumbled upon the Camphill Cafe. This community cafe is operated by members of the Camphill Community who are adults with a wide range of learning difficulties. It was a really lovely cafe with a great choice for lunch. The bread and tea cake we had were baked on-site and were delicious. It was such a lovely find and just what we needed for a lunch stop. It is open Monday to Friday, from 10am to 4pm. Highly recommended. A short walk further along the path, crossing a bridge over the road, and we came across the Peace Pagoda. It looked amazing against the clear blue sky. 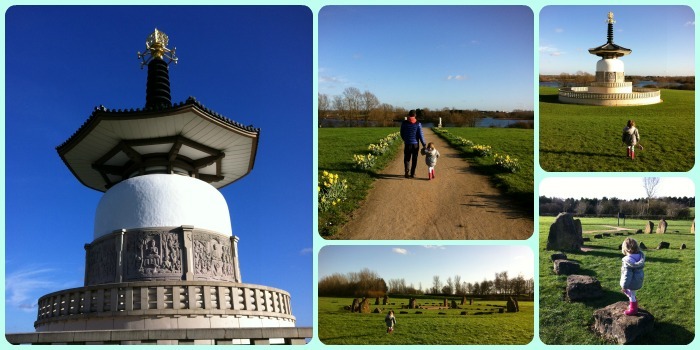 We had a good wander around the Pagoda and then along by Willen Lake North. There was an interesting stone circle - there was nothing to tell us any information about this but we had a play amongst the stones. You can also walk to Willen Lake South but we decided that we'd turn back at this point. So this walk could be a lot longer if you wanted to explore the other lake a bit more which also has a playground. We headed back to the car with another play in the Rhino Playground along the way. It was such a fun walk. When I'd been researching the location of the park, I'd also spotted on the map that we weren't far from a Tree Cathedral. 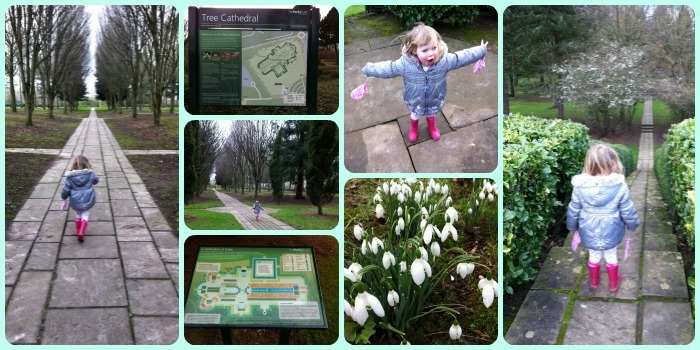 We enjoy visiting the Whipsnade Tree Cathedral so thought we'd take a look at this one which is planted in an outline based on Norwich Cathedral. It was very peaceful and nice to walk around. There was a mound that we climbed up and Little Miss A was 'king of the castle' at the top! By this point, the sun had disappeared and we were all a bit chilly and starting to tire so time to head home. What a great day we had though with lots of brilliant finds along the way. 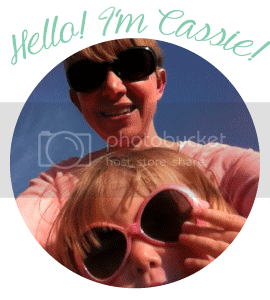 A real variety but it was nice to explore somewhere new and we had lots of fun along the way with Little Miss A. It really is a great park. Camphill was a great find too!